1-Click to Sync Outlook Contacts with Android Mobile Phone? If you have recently invested in a shiny new mobile phone, but your important contacts are stuck in that strange limbo between Microsoft Outlook and Android compatible, you might be wondering how on earth anybody manages to make the leap from one to the other and sync Outlook contacts with Android. As every new Android owner quickly realizes, it is something which cannot be done without the help of third party tools. This doesn’t mean that it cannot be done. It simply takes a little extra time and attention. The good news is that there is no need for either expensive syncing apps, or indeed the other extreme; unreliable and poorly developed free alternatives. Here are several solutions with step by step guides which can provide you with the basics that you need to learn how to transfer Outlook contacts to Android devices. No matter you want to sync Android contacts with Outlook, or transfer Outlook contacts to Android, you just want to keep your contacts safe or make it easy to share contacts with different mobile phones. To help you realize that goal, you can depend on Coolmuster Android Assistant and its Mac version Coolmuster Android Assistant for Mac. 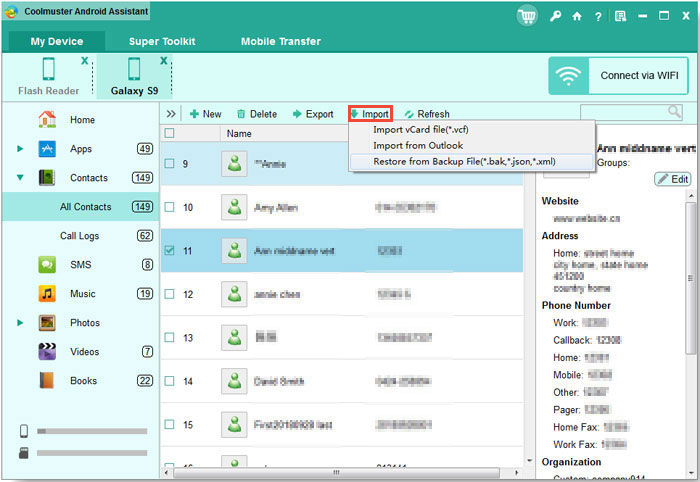 It is regarded as the best Android mobile backup tool for Android users to backup everything from Android devices like Samsung, HTC, LG, Motorola, Sony, etc. to computer, and restore them back to your Android device with 1 click. With its help, you can export contacts from Android to Outlook, and import contacts from Outlook to Android with one click! Step 1. Launch Android Assistant on your computer after you have downloaded and installed it. Use a USB cable to connect your Android device to your computer and make sure you have opened USB debugging on Android phone before Android Assistant can open and read all your phone data. Step 2: Once Android phone is detected by Android Assistant, all transferable file types are listed on the left side menu. Just choose the "Contacts" tab and all contacts on your Android phone will be scanned out. Select those you want to backup on computer and click the option of "Export" from the top menu. Step 3: To import contacts from Outlook to Android, you should click the option of "Import" from the top menu, choose the contacts you want and import them to your Android phone. Step One: On your computer, open Outlook and find the import tool by pressing the FILE button, and selecting OPTIONS, ADVANCED and then EXPORT – in that order. Now, press EXPORT TO A FILE and select the NEXT button. In the File Type tab, you need to find and select the COMMA-SEPERATED VALUES option. This is a tool which stores contact lists in a user friendly form. Step Two: You need to choose a contact file within the SELECT FOLDER tab. As Outlook contacts are imported in the form of an CSV file, they can only be exported one folder at a time. This can be frustrating, but it should not take too long, or be too difficult a task. Select the SAVE EXPORTED FILE tab, press the BROWSE button, and pick a suitable spot in which to put your CSV contacts. 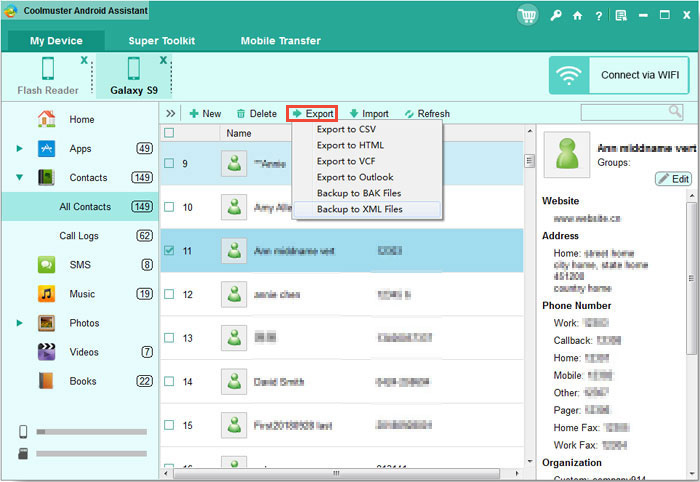 Press the OKAY button, and then choose a name for the CSV folder – repeat until all contact lists are exported, and then press the FINISH button. Step Three: Take a trip to the Gmail homepage, and sign in to your account. If you do not have one, you need to create one. On the main page, press the GMAIL tab and select the CONTACTS button. Launch the import function by pressing MORE, and selecting IMPORT. Now, select the CHOOSE FILE button, and find your previously exported CVS folders. These folders can be imported by simply pressing the IMPORT button. The contacts list should then be displayed within the CONTACTS tab. Step Four: Now, log in to Google using your Android device. If the device has already been synced, the contacts will be uploaded automatically. However, if Google and the device are not linked, you need to select the ALL APPS button, and then press SETTINGS. In this order, select ACCOUNTS AND SYNC, ADD ACCOUNT, GOOGLE, and then EXISTING. Once you have provided your Gmail log in details, all contacts should start to be uploaded to your Android device. Step One: On your Android device, open the Play Store and locate the Outlook application. Once found, download the program by pressing the INSTALL button. It can be opened after downloading, by pressing the OPEN button. Step Two: Log in to your Outlook account, by entering the necessary details (the same email address and password used to access Outlook on a computer). The program should then request a new nickname - choose a name and press the NEXT button. The nickname should be then be displayed as a tab on the Outlook navigation panel. This is the tab that you need to press, if you want to look at your email messages. If you switch to another new Android device and wish to transfer contacts between the two Android devices, I recommend the Coolmuster Mobile Transfer or Coolmuster Mobile Transfer for Mac to you. Apart from the contacts, it can also transfer text messages, photos, videos, music, apps and other files from Android to Android. It is compatible with all Android brands including tablets, such as Samsung, HTC, Motorola, LG, Huawei, ZTE, etc. Next, we show you the steps to transfer contacts between Android phones using Mobile Transfer. Launch Mobile Transfer on Mac or Windows and choose "Phone to Phone Transfer" mode from the primary interface to go to the transfer window. Using USB cables to connect the two Android phones to the computer. Mobile Transfer will detect the two connected phone and show them on the program screen side by side. After above options, you can start phone to phone transfer now. Just choose the "Contacts" tab and click on the transferring arrow that is pointing to the new Android phone. Then, your phone will start transferring the contacts. After learning all the ways about Android contacts backup, transferring contacts from Android phone to computer is really the easiest solution because it is pretty convenient to do so by using Android Assistant, and the program also enables you to restore the backed up contacts to your Android phone with one click, which is really helpful when you encounter data loss issue on your Android device. Therefore, get Android Assistant to take good protection on your phone data.